Here it is folks, another installment in the long running series of Leatherface movies and this time all the hot chainsaw action is coming at you in glorious 3D! Director John Luessenhop, who previously brought classics like Takers and Lockdown (anyone?) to the screen, now gets his chance to chop it up with a new batch of overly glossy young actors that may or may not ever be seen again. 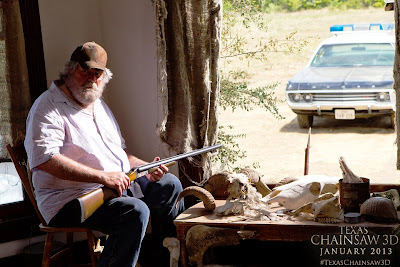 As opposed to doing a reboot, this version of the classic horror franchise brings us to the present day version of the original 1974 massacre and a continuation of the infamous Sawyer family legacy. 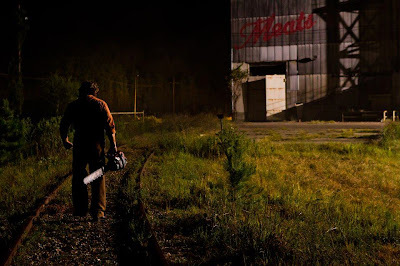 The movie opens back in the original timeline where a lynch mob looks to take out the entire family who they believed caused the gory path of destruction laid down by a masked man and his chainsaw. After a fiery standoff leaves the family in ruin, only an infant child is spared and ends up being taken by a husband and wife as their own child. Cut to modern times and a young girl named Heather who finds out she has just lost a grandmother she never knew she had. After learning some well kept secrets from her parents, she sets off to Texas with friends in tow to square away the final details of her mysterious relative's passing. One thing leads to another and before you know it, a guy with a literal "face mask" is chopping and hacking away everything in sight. What seems like a scenario headed down the same bloody path as before starts to reveal more and more dark secrets that may end up turning the whole town inside out before its all over. Yeah, so lets look at some of the bright spots here. Alexandra Daddario and Tania Raymonde are both really hot and Luessenhop does everything he can to keep their best assets exposed. Of course, this is coming from a guy's perspective and I'm sure the male actors in this film are also very pleasing to the female audience, but no need to go in to all that nonsense. What we have here is a movie that focuses on cleavage shots and chopping body parts in half. Honestly I really don't have a problem with that. 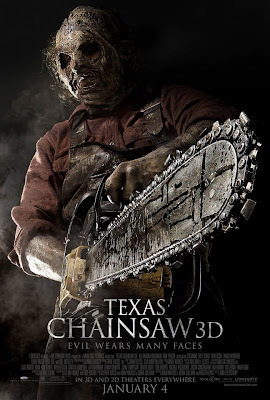 As far as the 3D goes, there's nothing ground breaking here, but there are more than a few gratuitous shots of chainsaws coming straight at you or rear ends busting out of daisy duke shorts that it would be hard to not recommend seeing it this way. 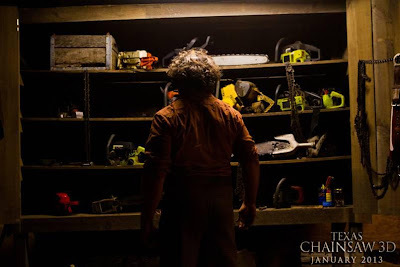 Fortunately, the fine film makers behind Texas Chainsaw 3D knew exactly what they were getting into and they end up delivering pretty much exactly what you would expect from a movie like this. When you sit down in the theater and put on the 3D glasses, just make sure to keep your expectations down in the basement and you won't end up locked in the freezer of doom or left hanging from the meat hook of destiny. 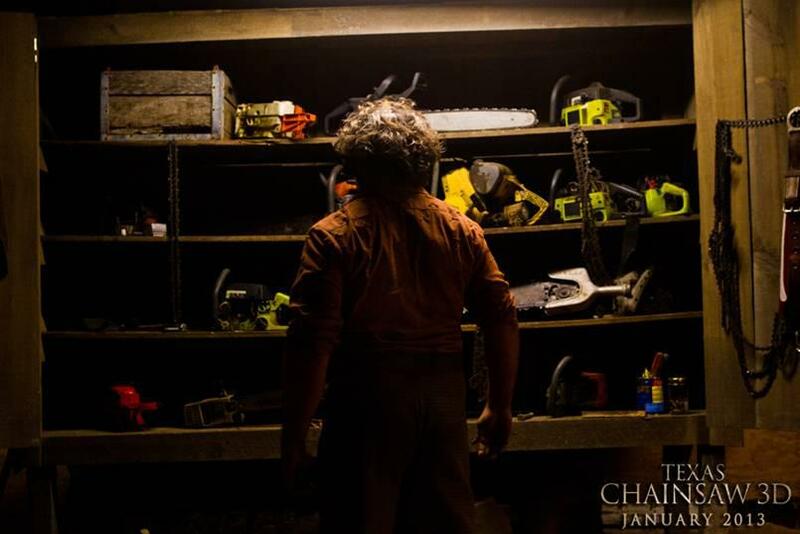 Just about the only good thing about this movie is the "creative" use of something you'd get from a tool store. Other than that, it could've used a lot more work. For me, I think killing someone using a chainsaw is the brutal form of death. This movie should not be seen by minor people.